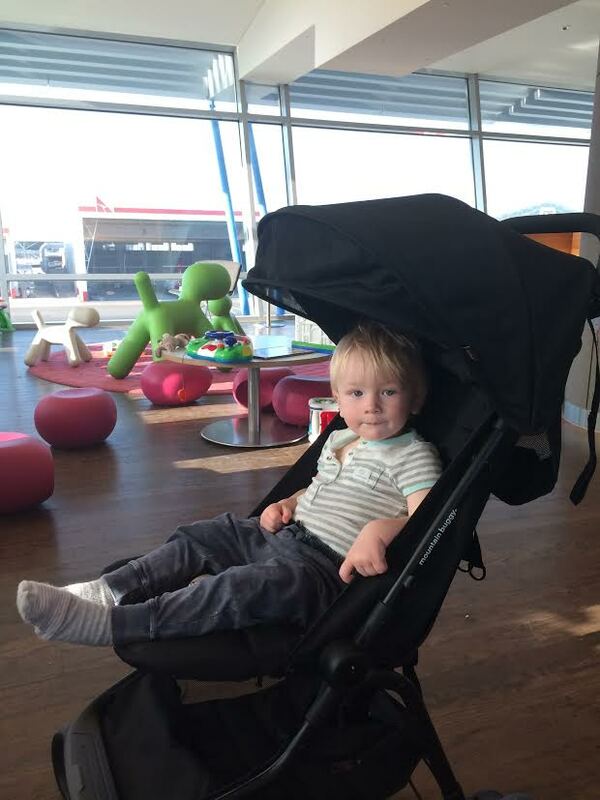 UPDATE UPDATE: Over the last 3 months I have been on approx 6 flights with Luke and the Mountain Buggy Nano travel stroller… since I wrote the below post, I have learnt a trick or two. Before boarding I make sure the stroller is in its travel case, and I use the shoulder strap to sling it over my shoulder and carry it on board. Usually the same arm as I am carrying Luke. I have not been stopped once. Once onboard, the stroller has fit into the overhead luggage compartment of all of the airlines (all domestic flights on Qantas and Jetstar). I just can’t tell you how much easier my life has been with this stroller on board. *just a reminder, if you read this whole article, there was a flight previously where it did not fit in the overhead, so it can vary.. but one out of 8 flights… its worth its weight in gold. I just love my new travel stroller, the Mountain Buggy Nano. Having moved around so much, and in particular having lived and had babies in Asia, I would consider myself well-travelled with children. So with the move to Sydney on the horizon and much much travel back and forth on the agenda (and many trips just me and the 3) – I thought I would check out what was new on the market travel stroller-wise and when I saw the Mountain Buggy Nano, I just knew it was time to retire my MacLaren umbrella stroller. If you have travelled with kids before, on your own, being it one child or more, you will know, after any flight (long or short) how tiring it can be when you arrive at your destination, only to have to walk with carry-on luggage and usually a very tired child all the way to the carousel to collect your stroller. You can imagine my excitement when the Nano promised to fit into my overhead luggage. To walk from the gate with a child in a pram takes away 99% of the stress. (Yes sometimes you can request the airline to provide you with a stroller at the airplane gate on arrival, but that is another story entirely.. check out “My Chaos” coming out within the next week). So this last week I travelled with it for the first time… and I just love it. Firstly I am a mountain buggy fan from way back (10 years to be precise). It felt amazing to take Luke up to the departure gate, whip him out, fold up the pram and head on board. It did seem a bit bigger than I anticipated (I had checked at home of course).. and as we were on a small plane, I was left gutted that it didn’t fit into the overhead luggage, but it did fit very very easily under the seat of one of the kids, and didn’t impact their legroom (totally worth the sacrifice even if it did). During our week away, the pram folded up and down soooo easily. Carried my heavy baby bag on the back, fit a few groceries here and there, was really easy to stroll around town with, and even over the grass at a local fair. I was surprised at just how well it worked, compared to my previous humble McLaren. It felt like the best holiday stroller ever. My return to Melbourne was a different story on the plane. The hostess (without the most-ess) was clearly on a power trip, and had issue with me taking it on board. I put up a good fight, but knew before I started it was a losing battle. She agreed to arrange for someone to meet me with a Qantas stroller on arrival. What really annoyed me once we were onboard, was that this was a bigger plane, and it would have fit in the overhead luggage compartment, no problems. I have since read a few reviews on this stroller, and was really surprised to hear a lot of comments about it not being that sturdy, or good for long term use. It’s a TRAVEL STROLLER PEOPLE! Designed for planes/trains/trams etc, not for everyday use… as a travel stroller, it is so easy to use and it is amazing! AMAZING! Make sure you check airline rules regarding carryon before you fly so you kow where you stand. Even if now and then it gets taken off you at the gate, it’s no different from what happens now. For me, it’s totally worth having. (Once Luke outgrows his full size mountain buggy, this will fit in the boot of our car for those school runs when Luke is asleep on his feet and needs a pram). This pram retails for A$349.. similar prams on the market are over $500 (but perhaps they do fit domestic overhead luggage, I don’t know). As for the Qantas stroller meeting me at the gate… as mentioned above, all will be divulged in “My Chaos” early next week. But this segment is called Things i Love (not bag the airlines) .. and I really do love The Mountain Buggy Nano. See the official Mountain Buggy Nano website here. Note: This is not a sponsored segment. All views posted in this article are opinion only, you should always do your own research before flying. Hi this is great to read as we have just purchased this stroller and travelling Jetstar in a couple of months. One question I do have when you pack it down in its bag ready for boarding do you remove the wheels or keep them on? Hi Emma, I wondered that at first too.. But you keep them on. At check in, if the want to ‘tag’ your stroller say ‘it fits in the overhead locker and has a bag’ if they question you (small chance) just say you have done it several times before… I have done it at least 30 times and am very confident. Good luck, I hope you like it.